Our new Promotional Video about Field Day has been published. Information on Field Day 2018 is being prepared. We will be at Badger Prairie Park In Verona again this year on the weekend of June 23 & 24. Save the date and come back here soon as our plans firm up. Date: June 23, 2018 1:00 PM - June 24, 2016 1:00 PM (guests can come earlier or stay later to watch/help with setup. Amateur Radio enthusiasts across the country put on an Open House called Field Day every year on the last full weekend in June. 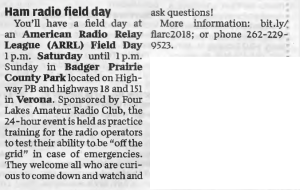 This year the Four Lakes Amateur Radio Club of Madison will invite the public to see what Ham Radio looks like today. We will set up at the Badger Prairie County Park, at the intersection of County Highway PB and US Highway 18 and 151, in Verona. We set up outside to test our ability to operate off the grid in an emergency, to provide a forum for people curious about ham radio to see what it looks like today and we spend 24 hours making contacts to other hams around North American and the world. Ham radio operators regularly provide communications for marathons and races and support communications used during emergencies locally and nationally. This is not your grandfather’s ham radio. Come on down and see, and listen, and if you are brave, talk! The event will run for 24 hours starting at 1:00 PM on Saturday, June 23. For more information go to http://bit.ly/flarc2018.